Infrared cameras are successfully used in R&D applications to speed up and verify the design process, as well as enabling fast, non-invasive and precise detection of deficiencies. 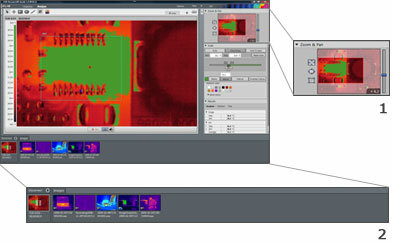 With R&D software the benefits and use of an infrared camera can be further extended and allow more in depth analyses to be made. FLIR QuickPlot is aimed at R&D users of infrared cameras wanting to get an understanding on thermal events for design, product or process. One of the more common R&D applications is testing how different materials are impacting the heat dissipation/performance of a device. The software helps with visualizing thermal patterns by creating time-temperature plots of the event, exporting plots in standard picture and data formats (csv, bmp, jpg), and allowing them to be analyzed afterwards. This is particularly beneficial for industrial R&D and automation activities, process control as well as for corporate R&D.